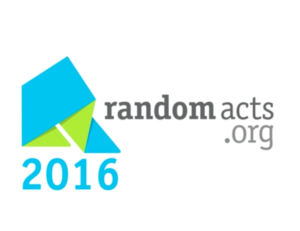 2016 was a big year for the Random Acts family. From providing funds for a number of incredible supporter acts to working with our cousins at GISHWHES to help Syrian refugees, we’ve been a part of more amazing moments than ever before. This past year also marked the final months of construction on the main building of the Free High School of San Juan del Sur’s new campus, which Random Acts is proud to sponsor. The talented local work crew building the campus will soon begin construction on additional buildings and campus installments over the course of this year. 2017 will likely hold a number of big changes and forward-thinking for us here at Random Acts, and we’re already digging into a few new partnership programs, like our friendship with the city of Juneau, Alaska, and its police department, for the recently launched Year of Kindness campaign. We’re also changing the way we #GetKind, reorganizing under a larger umbrella movement which we’ll detail in the coming weeks. For now, we hope you’ll take a look back over the past 12 months with us and realize that everything Random Acts managed to achieve happened because you — our dedicated supporters — opened your hearts and reached out to do some good, donating, volunteering, and inspiring your corner of the globe to be better. And for that, as always, we thank you.